In our continued integration with Lockheed Martin AFSS services (LMFS), ForeFlight Mobile now sends an acknowledgment notification when ATC accepts your flight plan. The acknowledgment is sent after your plan is filed and within the 3-hours to ETD window. The acknowledgment notification is in addition to the existing “Filing succeeded: Your flight plan was filed” message that appears upon filing your flight plan, and is additional assurance that your flight plan has been accepted by ATC. The filing succeeded message appears after tapping the File button, when your flight plan is successfully transmitted to Lockheed Martin. 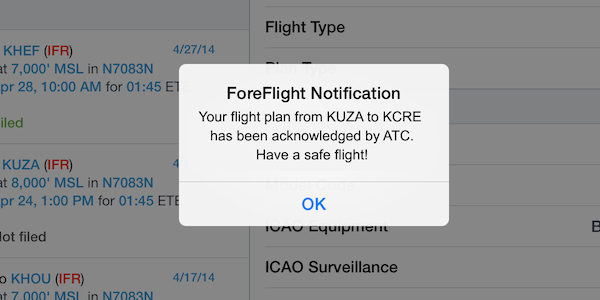 Push Notifications must be turned ON for ForeFlight in order to receive the ATC acknowledgment message. You can manage this in your iOS Settings by navigating to your Settings app, then Notification Center. Within the Settings app on your iOS device, tap on ForeFlight in your Notification Center list, then select your preferences. When your ETD is less than 3 hours, you will see the filing succeeded message after tapping the ‘File’ button, followed shortly by the ATC acknowledgment notification. When your ETD is more than 3 hours, you will receive the filing succeeded message after tapping the ‘File’ button. The ATC acknowledgment will be sent at around the 3 hours to departure point. IMPORTANT TIP: To set your filing preference to Lockheed Martin, you will need to sign out of your DUATS account from within the ForeFlight Mobile app. Navigate to More > Accounts > Account Logins. Tap on the CSC DUATS line and sign out if you have your DUATS account linked to ForeFlight. Please note that you will still receive your DUATS route briefing in the app. Navigate to More > Accounts > Account logins to sign out of your DUATS account. ForeFlight Mobile automatically files all ICAO type flight plans through LMFS. FAA/Domestic flight plans are filed through DUATS if you have DUATS credentials entered on the Accounts screen. The ATC acknowledgment notifications are available to both Standard and Pro subscribers. This entry was posted in ForeFlight Mobile and tagged electronic flight bag, flight plan filing, ForeFlight Mobile, iPad, Lockheed Martin by ForeFlight. Bookmark the permalink.